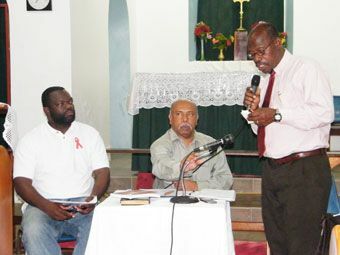 At a town meeting held last Wednesday, August 24, at the St. Johnâs Anglican Church, Minister of Health and area representative Ces McKie addressed residents who turned up to air their concerns and find out more information about the medical schoolâs operations. The most pressing issue at the meeting was that of finding accommodation for the 200 medical students expected to arrive next month. McKie encouraged home owners with apartments/rooms to rent to register with the schoolâs personnel, and make sure that they are up to standard. He also told residents that the representatives from All Saintâs have mandated that student accommodation must have air-conditioning and hot/cold running water. McKie further pointed out that the arrival of the medical school will not only create business for home-owners, but many others, including taxi drivers, car rental owners, food service operators and entertainment operators, among others. âThere will be many money-making opportunities for operators in the nearby vicinity,â he assured. He encouraged residents to not view the arrival of the medical school as a foreign invasion, but to embrace it and the opportunities it would provide for locals. âWe have to identify this university… as our own!â urged McKie. Also present to address the residents was prominent resident of West St. George Curtis King, who is also the deputy headmaster at the St Vincent Grammar School. He outlined the schoolâs programmes, fees and entry requirements for locals. The entire medical programme will cost overseas students US$82,000, while local students who wish to attend will be charged US$67,000. King explained that there are ongoing talks between local representatives and those from the medical school, to negotiate a 50 per cent reduction in tuition for local students who are âchallenged financiallyâ, instead of US$67,000. The minimum entry requirement for local students will be five CXC Caribbean Secondary Education Certificate (CSEC) passes and âAâ Level passes in Biology and Chemistry. McKie informed residents that the main road leading up to the medical schoolâs new site (the old West St. George Secondary School) will be patched, the area will be beautified, and more street lights will be installed in dark areas. He also said that police officers will have an increased presence in the region. All Saintâs University has leased the site for 20 years, and is spending approximately $500,000 to renovate it. McKie also said that the medical school is aiming to increase its student numbers to 1,000 within the first four years of operation, and will eventually increase the number of programmes on offer. Those who wish to contact the medical schoolâs representative for more information can visit the site between 9:00 am and 5:00 pm, or call (784) 530 7105.